Most of us can’t imagine what we did before, or what we’d do without, 24/7 access. We’re constantly connected to a vast mine of resources and information involving every area of our lives. Neither can we imagine what it must be like for the 60 million Americans, a disproportionate number of whom are Black and Hispanic, without home Internet access. 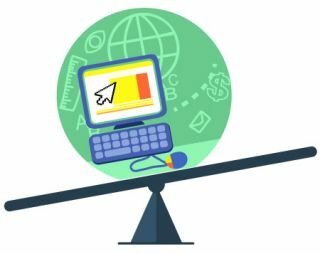 Digital equity is a complex issue that by its very nature reflects other inequities—from socio-economic concerns to the fact that all devices and Internet connections are not created equal. Digital equity also carries a huge price tag. But thanks to the efforts of those working in many different quarters—at the state and district levels, in the private sector, as well as through organizations like EveryoneOn—the divide seems to be slowly but surely narrowing. Since the first part of this series was published in April, for example, the FCC has modernized and reformed its Lifeline program to help low-income consumers afford Internet access with improved service, availability, and consumer choice. The stories in this third and final installment of Tech & Learning’s series on this important topic emphasize the power of determination and the thoughtful and creative allocation of limited resources for students in classrooms today, even as these districts work with stakeholders in their contexts towards the larger goal of digital equity. Ultimately connectivity is not just about the tech—it’s about family partnerships, community awareness and involvement, and a commitment to bridging the gap to provide new pathways to learning. West Middle School students utilizing the newly installed wi-fi on their school buses. The i3 grant enabled MCS to update the school’s wireless infrastructure, begin to provide 1:1 devices, and outfit school buses with wireless access. In addition, thanks to a Golden LEAF grant and a Z. Smith Reynolds grant, the district has been able to partner with The Friday Institute to offer an intensive 33-month training initiative for staff and administrators to equip them to move to a digital learning environment. Grant money only goes so far, though. “As leaders, it is our job to focus our resources in a way that will bring the greatest benefit for our students,” says Ellis. As assistant superintendent Jeff James says, it’s important to “think outside the box, because this is the only way small districts have a chance of competing.” Not only are districts like MCS competing—they’re also innovating in ways large and small that are being replicated all over the country. Candor Elementary School first graders learning how to use devices and log in with their usernames and passwords. Many MCS students spend three or four hours on the bus every day—time they’re now able to devote to learning with i-Ready instructional materials. One of the bus drivers notes that behavior issues have all but disappeared, and Griselda Alvarez-Cruz, an eighth grader, says being able to work during her long commutes is a major plus. “The Internet helps a lot. It has a lot of benefits for everyone, including me,” she says. KCSD students at Bancroft Elementary School benefit from the district’s laptop loaner program. “Students First, Technology Second” is the technology department’s motto at Kennett (PA) Consolidated School District (KCSD). Dan Maguire, supervisor of technology services, emphasizes that KCSD’s commitment to meeting the needs of each of the district’s 4,400 students drives everything they do—from device acquisition to program use to bridging the digital divide. Southern Chester County’s mushroom-growing industry has brought a significant population of Hispanic families and migrant workers to the area. And, although about a third of the district’s students qualify for free or reduced lunch, Maguire prefers not to divide the haves from the have-nots but to focus instead on the bigger picture—for the district as a whole and for the community. All students need targeted, personalized learning goals as well as increased access, Maguire says. So when KCSD piloted a loaner program with refurbished laptops in one of their elementary schools two years ago, staff worked with both students and parents to provide training and set learning objectives. “Parents aren’t always sure what to look for, how to help their student, or how to monitor utilization,” Maguire says, “so we give them support and tips as well.” A focus for next year will be monthly community workshops addressing topics raised by parents and others. Teachers can monitor student progress online and students use device-agnostic programs like Accelerated Reader and Study Island on the borrowed devices. Maguire notes that the shift to online content gives these devices increased longevity. As Maguire, a former classroom teacher, says, “It’s an instructional initiative, and not so much a technology initiative.” KCSD now operates the popular loaner program in all of its schools and there’s an informal network of hotspots throughout local businesses and community centers offering free, “no purchase necessary,” wi-fi access to students. At the other end of the K–12 technology spectrum, Maguire recently worked with a reseller to purchase refurbished equipment to meet the growing and sophisticated demands of the high-school STEM students. Maguire describes KSCD’s approach as organic and strategic, growing the technology program to stay just ahead of student demand while maintaining an ongoing dialogue with the community and taxpayers to educate and cultivate buy-in. Transparency and open doors are important, especially when there are such significant financial implications. “We’re working together to benefit the entire community,” he says, towards the ultimate goal of municipal access. When a fifth-grade class at Bancroft Elementary School recently took a virtual field trip to Longwood Gardens, it was all about the experience and the tech faded into the background. It’s ironic, Maguire admits, but “that’s the way it should be.” He listened to the students’ exclamations of delight and surprise as they toured the legendary gardens and knew he had once again created an authentic experience the students won’t soon forget. Students in Lufkin (TX) ISD using technology for learning. While 87% of Lukfin (TX) ISD students have home Internet access, fewer have access to a computer or tablet and a majority access information through a mobile device. Rafranz Davis, executive director of professional and digital learning, also notes that “we do not have immediate access in every classroom … So, even if our students bring devices to class, there’s no guarantee that they can connect.” Davis also stresses the significance of the digital use divide. On the way to realizing Davis’s vision of all students and teachers having “anytime, everywhere access,” this diverse district, with a majority of economically disadvantaged students, has completed a district assessment, gathered BrightBytes data, and begun some ambitious initiatives. Last fall, two second-grade teachers who wanted to individualize learning dug some six-year-old mini laptops, complete with missing keys and technical issues, from a closet. After removing all programs and loading only the Chrome browser, they used tools like Padlet and blogging—and students began communicating in ways they never had. Davis says, “This act of courage became our district’s first unofficial elementary 1:1 environment.” Now, with an access point, these students are doing projects involving collaborative research and data analysis. Click here to read Part 2 and hereto read Part 1 in this series.